Shares in Australian lithium miner Orocobre (ASX: ORE,TSX: ORL) dropped Thursday after it said that prices received for its output dropped in the half of its fiscal year ending in December, and noted it didn’t expect a significant improvement in the short term. The Brisbane-based producer of lithium carbonate, used in the making of batteries that power electric vehicles (EVs), expects to obtain an average of $10,800 per tonne on about 2,850 tonnes of the product in the fourth quarter. That would be an 8% decline on the previous half and over 26% lower than the $14,699 per tonne the company received in the prior quarter. Orocobre’s gloomy outlook worried investors and triggered the company shares to slump, closing 13.6% lower at A$3.37. It also dragged other lithium miners down — Galaxy Resources (ASX:GYX) fell 10.20% to A$2.23, Pilbara Minerals’ (ASX: PLS) stock price dropped 7.3% to 64 Australian cents, and Kidman Resources (ASX: KDR) closed has plunged 9.5% lower to $1.05. “The pricing achieved recently has been affected by soft market conditions in China, which had a direct impact on shorter term contracts,” Chief Executive Richard Seville said in an online update. “I’m reluctant to provide guidance on pricing at this point [but] I’d have to say it’s not feeling strong. We are not expecting a rebound in pricing at this point in time,” Seville said. 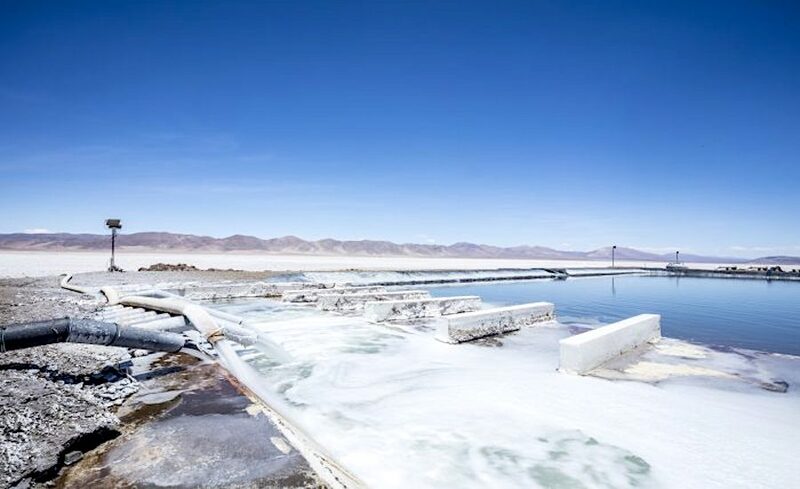 Orocobre’s forecast are in line with Chile’s lithium miner SQM, which in August flagged a downward trend in prices caused partly by new supply ramping in Australia and an ever-rising number of projects expected to come online by 2020. 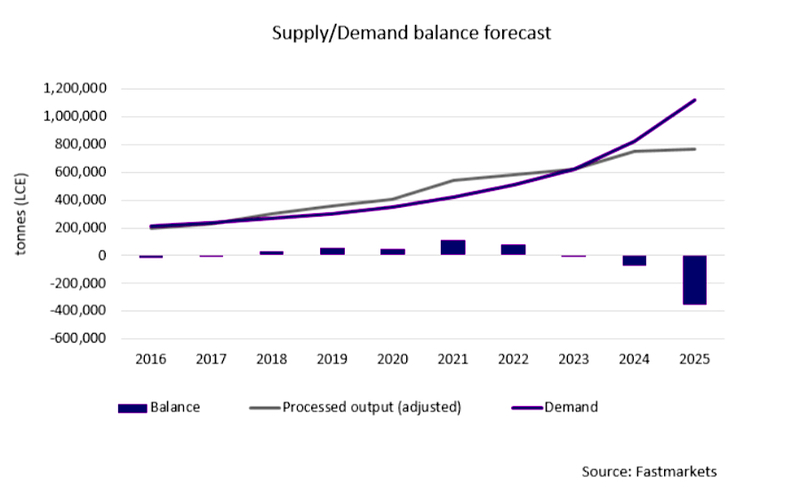 Expected strong lithium demand will not be able to offset a decline in prices experts say, even though they predict the need for the commodity from battery makers alone will jump 650% by 2027, while overall demand is forecast to rise more than threefold in the next nine years. Fastmarkets MB believes 90% of the price weakness this year has been down to the lithium supply response. 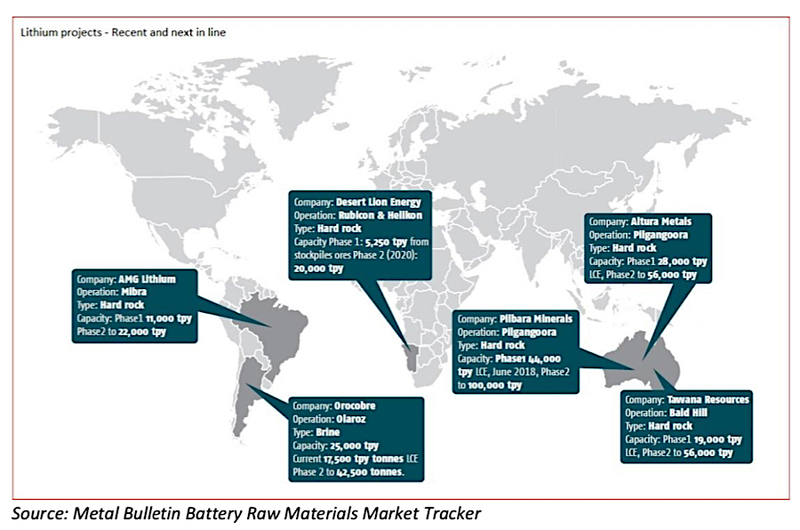 In 2019, William Adams, Head of Research Base Metals & Battery Materials says, supply is expected once again to grow at a faster pace than demand. However, exponential growth from the EV sector and the lack of sufficient supply, will see prices spike again by 2025, he predicts.